My mom is a jeweler / glass artist. I grew up around the tools and though I never set out to learn, I picked up a few things. That means that when I see a piece of jewelry that I like I usually: a) think it's over-priced and b) set out to make one for myself or ask my mom to make it. This time around I made 9, which left plenty of time for me to document the process for you all! There are really nice tools and specialty stores out there, but that would defeat the purpose of doing it on the cheap. All of the supplies are available through JoAnn (or similar craft stores) with a coupon. You may even have some at home already. 5. Cutters. A nice new pair of nail clippers will do the job too! 6. Pliers, 2 pairs. Look through your tool box. 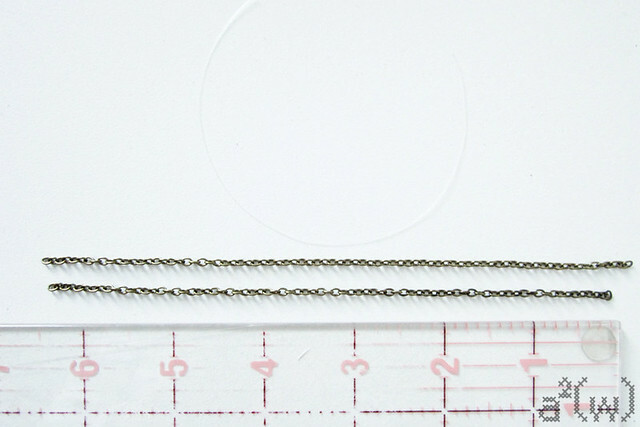 1) Cut 2 lengths of chain to 6.5" and 1 length of monofilament to 6.5". 2) Thread a crimp bead onto the monofilament, then one end of the chain. Loop the monofilament back through the crimp bead and leave a 3/4" tail. 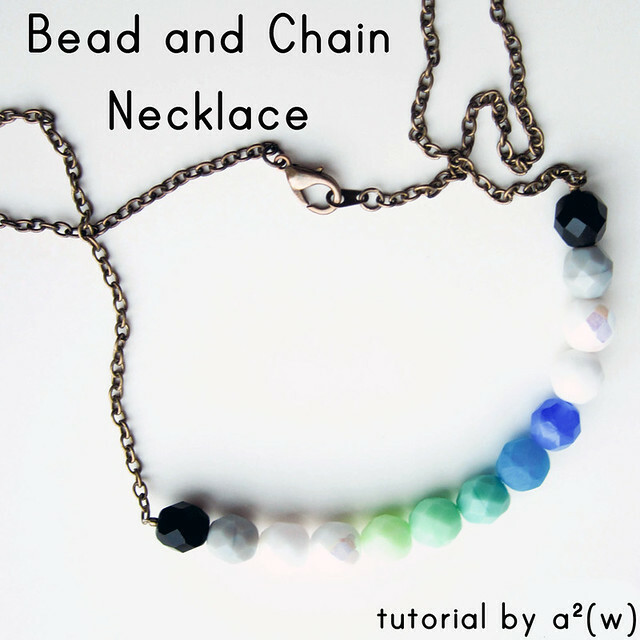 Leave a small gap between the bead and chain to give the necklace some flexibility. 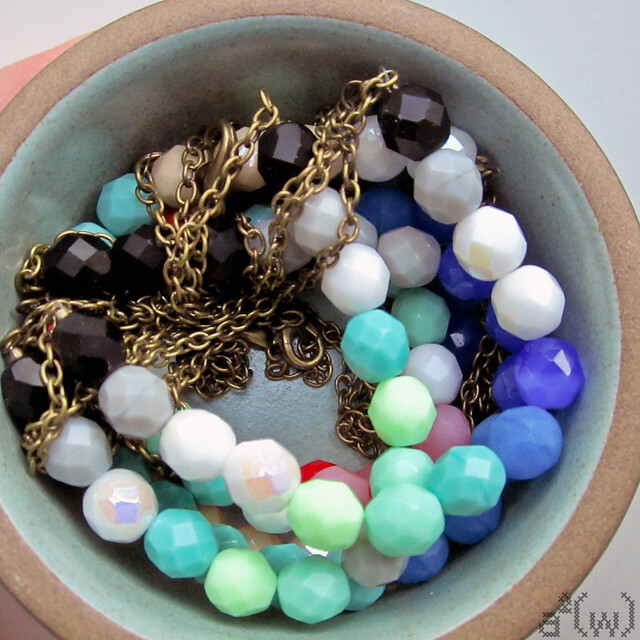 3) Crimp the bead in hole 1, then smush it again to compact it in hole 2. 4) String the beads onto the monofilament, making sure that the 3/4" tail is also threaded through the beads on the end. 5) When all the beads are strung, string the other crimp bead and other piece of chain. Loop the end of the monofilament back through the crimp bead and 2 end beads. Leave a smal gap between the crimp bead and chain, then crimp the bead. Trim off the excess monofilament. 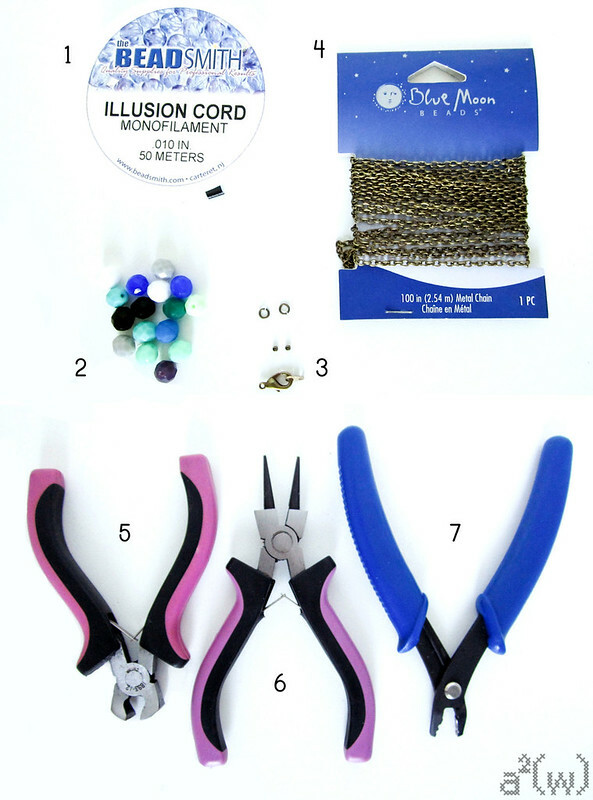 6) Open one jump ring using the pliers. Thread on the end of one side of chain and your clasp. 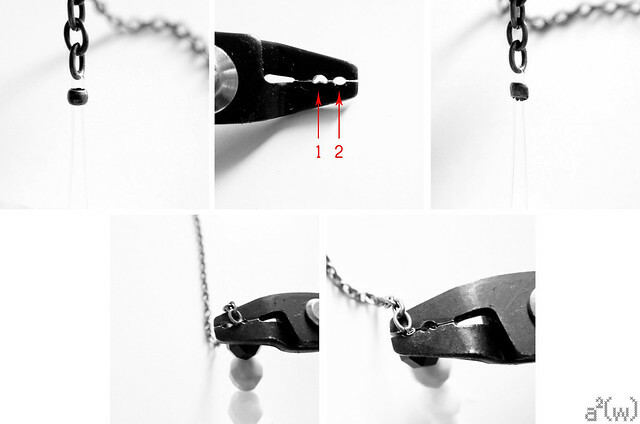 Close the jump ring using the pliers and matching the ends using a back and forth motion. Here is a good video demonstration. Repeat on the other end of the chain with the other side of the clasp. This is really cool, Ali! I want to try this! 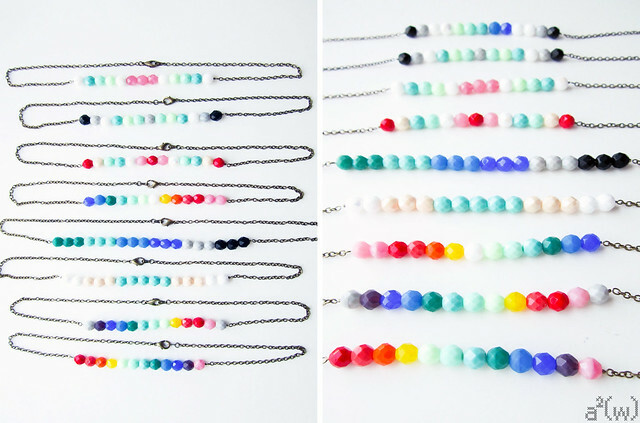 Ali, these necklaces are so cute!!! Love it! Thanks for sharing your technique!